But before I get into that story, I'm going to share something a little more personal with you. I've been looking all over for a specific set of photos, with no luck. The photos I seek would have been taken in December 1992, at an event held at Lake Fort Smith State Park group facility by the local chapter of the Society for Creative Anachronism. This is as close as I'm going to get. 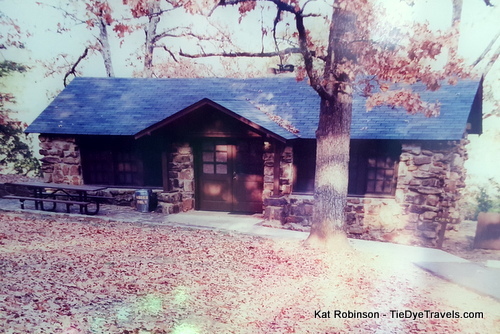 This cabin was located next to the dormitory at that park, and this photo may have been taken within a few years of that particular event. It may give you an idea of what the park looked like back then. It's important to me, because that's where I met Grav. And one of these days, I *might* share with all of you that story. Our closest friends know it. But even back then, Lake Fort Smith State Park was one of my favorite places to go. It was in a valley north of Mountainburg, and you could swim and fish there with the Ozarks overhead. Smith and its surrounding areas. 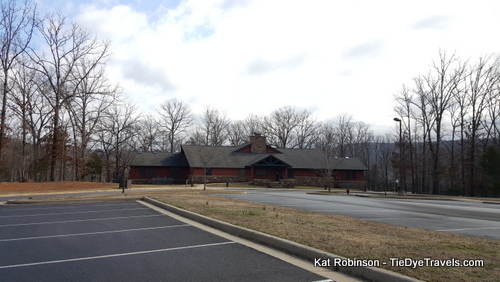 It was called the Mountainburg Recreation Facility, and it was mostly built by the Works Progress Administration. In 1967, it became an Arkansas State Park, and the state made many upgrades, including a great pool. 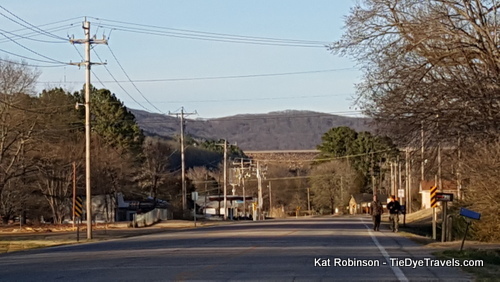 A lot has happened between the 1930s and now, and the undeniable fact came in that the city of Fort Smith and its surrounds needed more water than the original Lake Fort Smith State Park could provide. 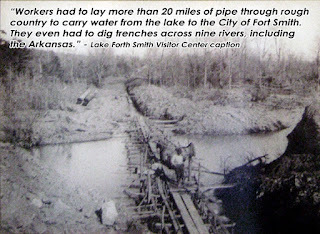 So in 2002, the old Lake Fort Smith State Park was closed and construction was begun on a new dam. The original dam was just 89 feet. The new one, at 190 feet, now towers over the town of Mountainburg below. Its expansion also caused the body of water to merge and become one with Lake Shepherd Springs, which had been upstream from the park. The original park lies under a lake. So unless I learn to scuba dive, I can't go back to the place where I met my photographer. 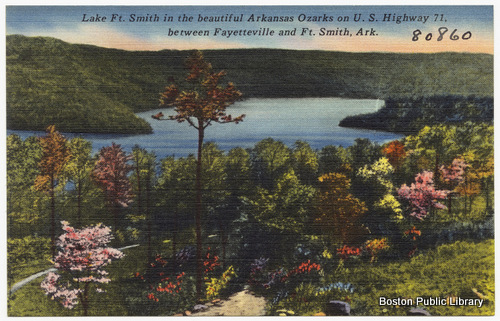 You can learn more about this history of Lake Fort Smith State Park at the Encyclopedia of Arkansas. But that wasn't the end of Lake Fort Smith State Park. Though moving the old stone cabins and such was out of the question (never mind that swimming pool! ), the city of Fort Smith gave $10 million to build a new park, and coupled with $12 million from the 1/8th cent Conservation Tax, a new park with new facilities was built. 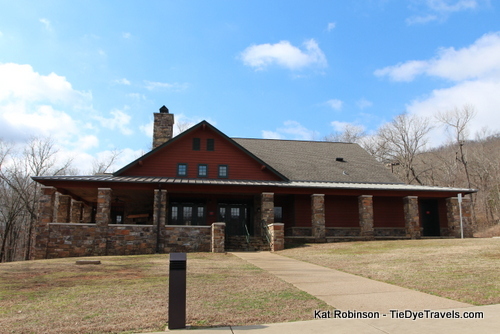 Lake Fort Smith State Park reopened in May 2008 with a brand new visitors center, campground and swimming facility. 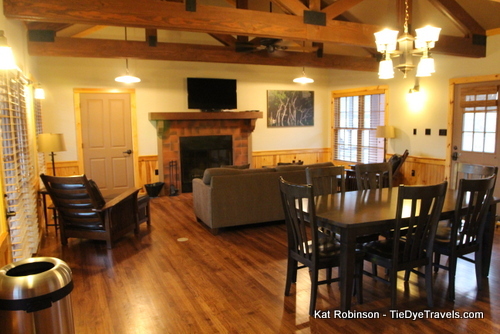 In the years in-between, a new group lodging facility, which includes a dining hall and two dormitories that sleep 32 people each, have been constructed. 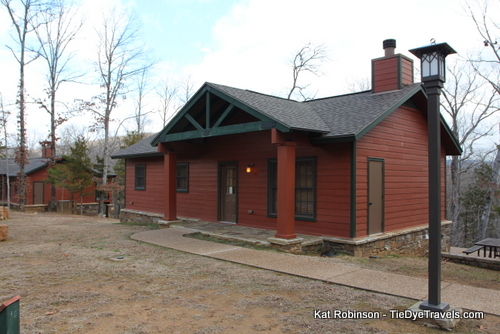 And in 2013, the park's 10 new housekeeping cabins have been opened. I've visited the park several times since it reopened, but I've never been able to stay on the site until now. Lake Fort Smith State Park's location right off US Highway 71 made it a natural for an overnight stay. 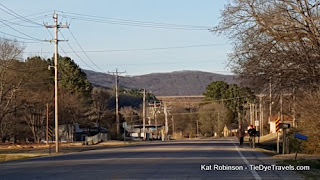 So we added it to our itinerary on our epic road trip along US Highway 71 from the Louisiana border to the Missouri State Line. 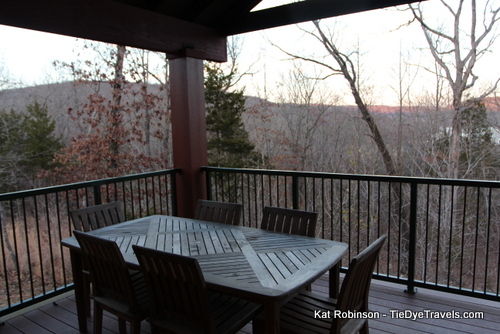 Now, the first thing you need to know about a stay at Lake Fort Smith State Park is that it isn't in Fort Smith at all. It's 35 miles away in Crawford County (Fort Smith is in Sebastian County) and it's about 45 minutes drive-time away. But it's not too far from both I-40 and I-49 in northwest Arkansas. Second thing is, Lake Fort Smith is far below US Highway 71 at that point. Highway 400 is one continuous downhill snake of a highway that loses a lot of elevation on the way down. Cell phone signal is spotty, as is wifi. 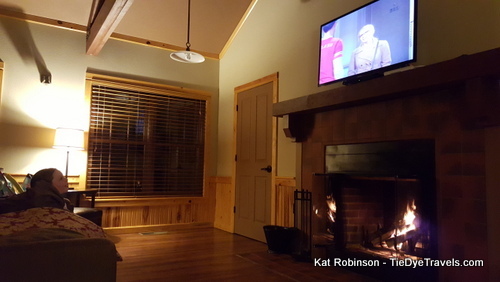 In fact, there is absolutely no wifi at the cabins, but that's all right. 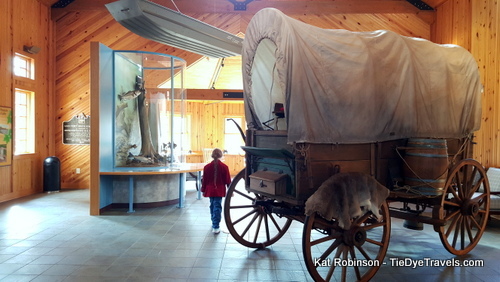 Chances are if you want to visit Lake Fort Smith State Park, you're not looking for a tight connection. Though the sun had not yet set when Hunter and I turned off onto Highway 400, it was far below the horizon when we got to the bottom of the two mile stretch. Directions for getting into our cabin had been left on the door of the visitors center (we had arrived after 5 p.m.) and we comfortably made our way to Cabin 5. From the outside, the cabin might not have seemed like much, but what was inside was truly magnificent. The at-grade spaces for parking attached to a sidewalk that went right up to the cabin, and opening the door revealed a cross-beamed great room. 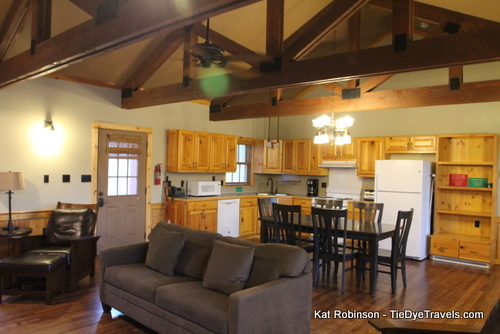 To the left, a full kitchen sprawled around a huge dining room table. 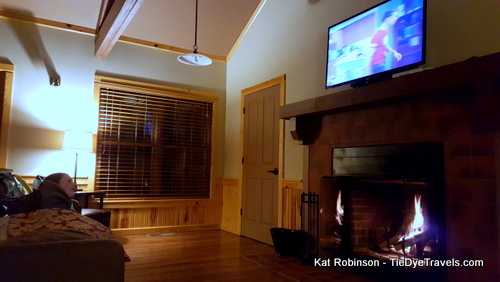 To the right, two comfortable chairs and a hide-a-bed sofa were aimed at a fireplace topped with a flat screen TV. This room alone impressed me. 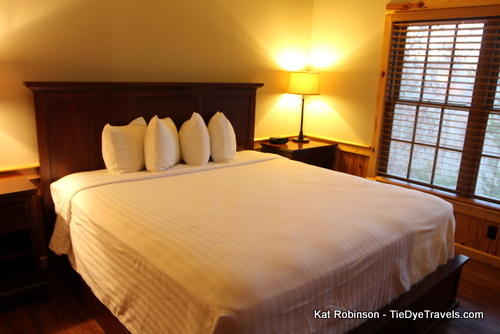 Through a doorway, the bedroom revealed a king sized bed and side dressers. 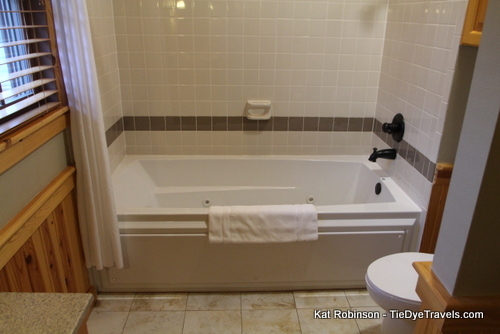 Beyond, the oversized bathroom stood, with the surprise (to me) of an oversized jetted tub. Yes, after several days of driving, this made me very happy. television and got comfortable on the couch. It may not sound spectacular, but the evening was lovely. I had a bath and then curled up with a good book in one of those comfortable chairs. The only sound outside the cabin was the wind and the frogs. When the temperature started to drop, we started a fire using the bundle of kindling and firestarter left for us by the state park folks. Falling asleep in front of the fire was amazing. The next morning we breakfasted and took an inventory of what we had, and for once repacked the car (it was closer than at any of our hotel stays along the way). 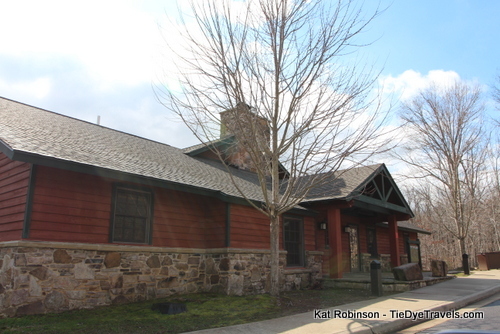 And before we left, we visited the visitors center and learned about the history of the park together. 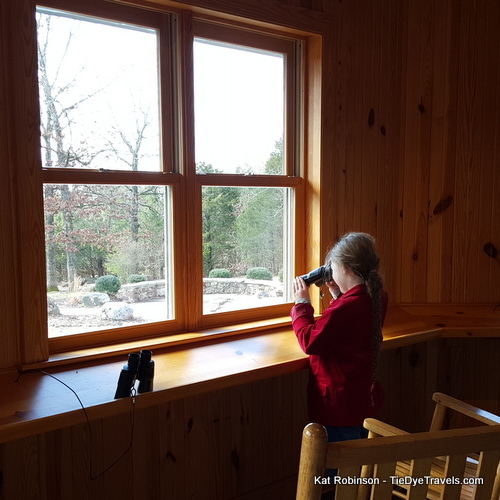 Hunter took great joy in using the binoculars in the lookout room at the back of the visitors center to peer out at the woods and see all the birds beyond. Before we left, I drove around and showed her some of the facilities, such as the marina and the playground. And I took a photo or two of the pavilions that stand by the lake these days. They're striking. If you'd like to learn more about Lake Fort Smith State Park, check out the website. 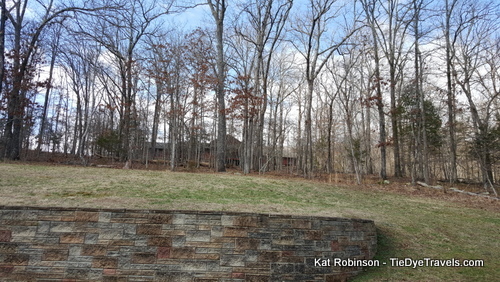 And scroll down for photos of the park's group facilities.